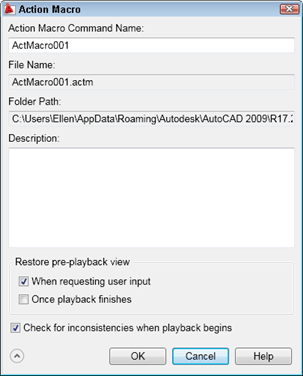 Since AutoCAD 2009, you can record macros for later use. You can include requests for user input and messages to make the macro work interactively. When you save a macro, it has an ACTM filename extension. 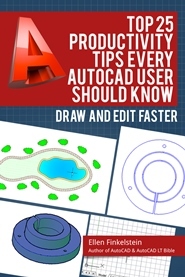 You’ll find it in your Support\Actions folder of your AutoCAD installation. You can share ACTM files with others. Start by thinking about the conditions that you’ll need when you run the macro. Will you be in model space or paper space? The macro doesn’t keep track of all of the current settings. If a certain setting is necessary, use the system variable or the SETVAR command while recording the macro to make sure that you have the setup you’ll need at playback time. Macros also don’t record changes to a dialog box, which means that you may need to use the command line version of a command. If you’ve worked with scripts, you’re familiar with this type of functioning. You may find other limitations. You’ll find the Action Recorder on the Tools tab, in the Action Recorder panel. You can also choose Menu Browser (the A button)> Tools> Action Recorder. Here’s an example of how you would create a macro to change all objects to the default 0.25mm lineweight. You might get drawings from a company that adds lineweights to objects. Moreover, their default might be different. 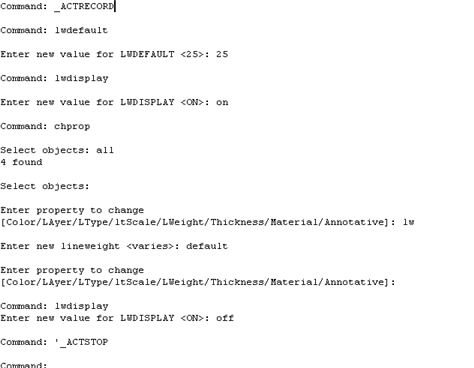 So this macro sets the default to 0.25, turns on the display of lineweights, and then uses the CHPROP command to change the lineweight of selected objects to the default. At the end, the macro turns off lineweight display. Figuring out which commands to use often involves some research. For example, I knew that I could turn the lineweight display off and on using the button on the status bar, but I couldn’t do that in the macro, since I didn’t know which way the display would be when I played back the macro. If I wanted to turn the display on, and it was already on, clicking the button would turn it off! So I needed to find the system variable involved, which was LWDEFAULT. Then, it was easy to turn it on and off as needed. When you’ve figured out the steps that you want to take, and tried them out a couple of times in different situations, you’re ready to record. Choose Tools tab> Action Recorder panel> Record. Your cursor now has a red dot, to show you that you’re recording. Go through the steps that you practiced. When you’re done. click the Stop button that has replaced the Record button. You now have the opportunity to name and save the macro, as well as choose a few options. 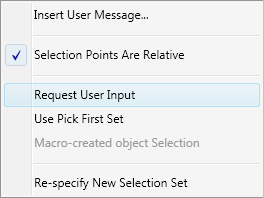 Because I specified all at the Select objects: prompt, the macro will always select all objects. I tested that by adding more objects with a non-default lineweight; they were also changed. 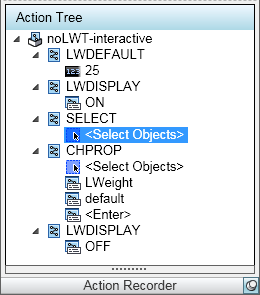 I might want to be able to select individual objects. Letting the user select objects makes the macro interactive, and it’s a very helpful feature. When I ran the macro, I got a dialog box asking if I wanted to provide user input. By accepting that option, I was able to either select objects, or enter all. Do you use the Action Recorder? Leave a comment about how you use it! Can forgotten actions be appended to an existing action macro? I can’t seem to modify them once they’re recorded. 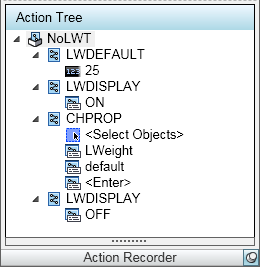 Scott, You should be able to display the macro in the “Action Tree” below the Action Recorder panel by expanding the Action Recorder panel, then right-click an action, and choose Edit. But I’m not able to display it now–not sure why (I have a screenshot of it in my book, so I know it exists.) When I click the panel name, nothing happens. Do you see the Action Tree? But I’m not sure if you can actually add steps that you left out. 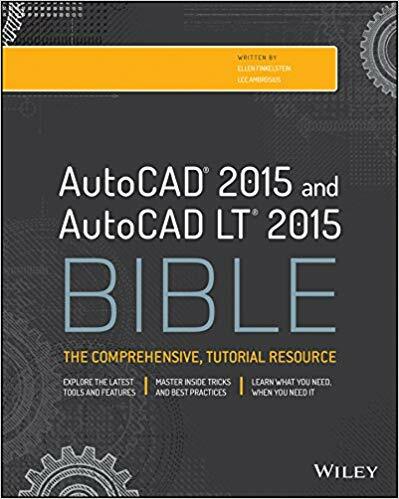 How do I migrate a customized toolbar in AUTOCAD 2002 to Autocad 2010 or the lasted version of Autocad? I tried to use Action recorder to automatically create Blocks in CAD. But when it comes to do something inside the opened windows, it does not show that in the command line so I can get what is happening. I’d appreciate if you could kindly help me in this case. I’ve made an action macro, but i would like to make a keyboard shortcut for this macro. I can’t find my macro in the list of commands in the cui? I sent you a macro last year that puts a horizontal and vertical construction line on a drawing with one click. Do you have a copy of that macro so I can recreate the tool bar button here at my new office? Thanks. Good Day, i haven’t learn more about the autor card which is very painful to my status and i don’t mind if i can get it done here it be my pleasure to have a full knowledge about the autor card and some aspects that relate to construction. Thank you. Akande Taofeek. How to record Hatching any selected pattern name? I tried but it switches to current setting.